Cost: When I first subscribed to the Times-Union in 2011 the annual subscription cost was $185.12. It is now $623.65, a 278 percent increase. I can no longer afford this daily luxury. Content: The paper used to land in my driveway with a thud. It now flutters in. I miss the hefty paper that contained a wide variety of timely local, regional, national and international news and features. The daily opinion pages have been halved, and the news content has dramatically shrunk. Bias: Despite having a conservative outlook I don’t look for material to reinforce my beliefs. However, ever since the new owners took over from the Morris family, the paper began titling further and further left in its news reporting. The dependence upon two left leaning news outlets — the Associated Press and Washington Post — is an example. Many of my acquaintances and the paper’s “Letters to the Editor” writers agree. News Judgment: Despite no longer having room for in depth articles on topical national or local issues, readers are subjected to page-after-page of mindless twaddle about the city’s Jacksonville Jaguars professional football team. Two page 1A stories above the fold about the color of the team’s new uniforms and an almost complete page 1 story in the food section on how to boil an egg cooked that paper’s goose for me. The paper is hemorrhaging advertisers and apparently is trying to make up the lost revenue by squeezing subscribers. One of the last issues I saw had five display ads in it seeking “Sales Consultants”, “Advertising Sales Assistants”, “New Business Account Executives”, “Digital Media Sales Consultants”, etc., but not one for editorial talent. Any new sales talent should focus their efforts on establishments that cater to football fans or sells Jaguar paraphernalia, as that’s apparently the paper’s target audience. When I told my wife, Linda, of my decision she asked if I would miss reading the baseball scores and looking at the box scores each morning. I told her “no” because they weren’t in our edition anyway. Apparently baseball gets in the way of the fanatical Jaguars football coverage and the paper’s new out-of-town printing operation and its early deadlines can’t accommodate even late afternoon scores any more. In a nutshell, management’s business plan is asking customers to pay more for a shrinking and inferior product, unless they’re fanatical and left leaning Jacksonville Jaguar fans. I attempted to contact the Times-Union circulation department several times and despite pushing all the buttons I was prompted to by the recordings, I never succeeded in reaching a person. Recently I received a call from this group that was a recording telling me that my subscription was lapsing and that I should press “1” to speak to a representative. I did as I was told only to be connected to another recording. No matter how long I waited or how many more numerical buttons I punched I never reached a person. As a former daily newspaper reporter, it saddens me to walk down my driveway each morning for the first time in many decades and not pick up a local paper. I still receive the daily Wall Street Journal, a very well-written national business and news publication with an increasing subscriber base. But it distresses me to observe what’s happening to the local daily newspaper industry. And it isn’t just the local newspaper segment of the media that’s lost its way. When “Time” and “Newsweek” magazines became slavish patrons of the left and Barack Obama sycophants and focused their editorial efforts on their online segments, I searched for a alternative weekly print news magazine that would provide me with unbiased (not right or left) news reporting and facts. I discovered “The Week”, a magazine that during my first few readings, appeared to be a publication I had in mind. But the unexpected election of Donald Trump apparently caused consternation, confusion, chaos, and mass hysteria among this magazine’s top management and editorial ranks. 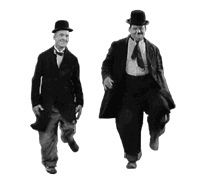 Soon after the November 16 vote, the magazine’s Editor-in-Chief William Falk and one of its Managing Editors, Theunis Bates, began churning out page 3 editorials, just above the Table of Contents, condemning President Trump willy-nilly on almost every issue, the latest being immigration. The June 8 issue included a wacko front page cartoon of a border patrolman carting a child off while her mother with outstretched arms, wails in the background. 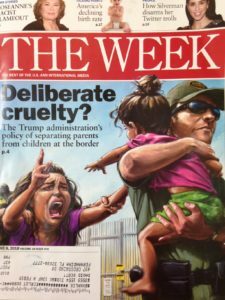 The headline that accompanied it screamed “Deliberate cruelty?” with a subhead saying “The Trump administration’s policy of separating parents from children at the border, page 4.” Editor-in-Chief Falk’s page 3 tirade suggested that President Trump was a “madman, needy, impulsive, and theatrical.” The magazine gave up being a “news” publication and has morphed into an “opinion” periodical for the left. I’m letting this subscription lapse too. I want a “news” magazine. Give me the facts. I’ll form my own opinion based on those facts. For opinion I’ll read Mother Jones, New York Magazine, The New York Times, National Review, American Spectator, the Weekly Standard, etc. Speaking Of BS: Members of the “caravan” of some 1,000 immigrants from Central America that traveled through Mexico to eventually end up at the U.S. border crossing in Tijuana claimed that it wasn’t safe to stay in Mexico. Based on that reasoning, the entire population of 131,000,000 Mexicans should be granted asylum in the U.S. Why didn’t Mexico turn these folks around and send them back home or to a country where they could find refuge in a more hospitable place and a culture more compatible with their own? While liberals wail hysterically that children are being ripped from their illegal immigrant mothers’ arms, where is that weeping and gnashing of teeth when American parents are arrested for crimes ranging from shop lifting to drug dealing, that cause them to be separated from their children? It’s obvious that President Trump has driven the left in this country insane and left it wallowing in a cesspool of hypocrisy, irrational hatred and silliness much to the amusement of those on the right. A Cool Reception For Local Veterans: While headed to the downtown Amelia Coffee Shop this past hot and humid Tuesday a lady stopped me at the corner of South 3rd Street and Centre and asked if I was a veteran. I replied that I was and she said “Thanks for your service” and handed me a certificate for a “free ice cream” at the corner Fantastic Fudge shop. I gladly accepted, went inside and retrieved my reward, returning to chat with the two pleasant women who were handing out the free treats while asking for nothing in return. It turns out the ladies work for The Lakeside, a senior assisted living site at 649 Amelia Island Parkway on Amelia Island. I had to ask for a brochure. Even though I’m not yet in the market for their facility I like this kind of low-key sales approach. To find out more about The Lakeside go to LakesideAmeliaIsland.com. Says Who? Department: Good friend, Vice President of the Georgia Public Policy Foundation and South African native Benita Dodd poses an interesting question: How was it decided that Megan Markle is “biracial” and Barack Obama is “African-American”? David Yulee checking to see if his time is up. The “If You Can’t Say Anything Nice” Department: The “Amelia Islander” magazine, which is published by the pleasant husband and wife team of Philip and Deana Kelly, is a slick, free monthly publication that consistently contains 60-80 pages of glossy color photos and puff pieces about Amelia Island aimed at tourists and a handful of naive locals. If you’re looking for where not to go or places to avoid this isn’t the publication for you. There has never been a piece in this magazine critical of a historical site, hotel, B&B, beach area, boating experience, local personality, historical figure, natural preserve, deadly disease, or anything else. If you own a restaurant and the magazine contacts you saying it wants to write a review of your joint, jump on it, as no matter what you serve or how bad it may be, you’ll get five stars. I’m not saying this is a bad thing, as this business plan obviously works, since the publication is jammed with local advertisements, all safely secure in the fact they are immune from any criticism, warranted or unwarranted. However, the most recent issue of this magazine — which is mailed to my house free despite the fact I never requested it — should be called out for an omission conspicuous by its absence. The cover story by acquaintance Karen Miller, titled “Many Threads One Tapestry” about the island’s African-American heritage including slavery, left out a key historical segment — David Yulee. Ms. Miller’s article relates the story of how black slaves were brought to the island by force, worked at nearby Kingsley Plantation and were even owned by black slave holders. It goes on to describe how “colored troops” in the Union Army served at Fort Clinch and relates the Jim Crow discrimination era of American Beach. What it leaves out is the fact that David Yulee’s railroad, which historians claim put Amelia Island on the map, was built by slaves Yulee owned. 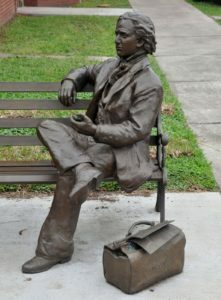 A statue of Yulee, who was imprisoned for treason following the war, sits in front of the old train station, now a tourist information center, downtown. Leaving Yulee out of this piece is like calling Hurricanes Mathew and Irma warm summer breezes. Pajamadave, a neighborhood beer nut serving other local beer nuts. A Guy Walks Into A Bar: There’s a bunch of stories that begin with “A guy walks into a bar” and so did the one in The May 31 issue of Sports Illustrated by Steve Rushin about Cheers, the show that disappeared from our TV screens 25 years ago. Rushin describes the fictional bar and its patrons and laments the fact that its kind won’t be found again. He recalls in the article: “…there were two kinds of beer – regular and Lite. There was no Internet. Almost nobody had a cell phone. If you wanted to summon dubious facts in an instant, you consulted at your peril, the blowhard postman and Cheers regular Cliff, who preceded half his sentences with: “Little known fact…” The owner Sam Malone, a washed up relief pitcher for the Red Sox, had many athlete friends, including Bruins goal tender Eddie LeBec, who was killed while performing as an ice-show penguin in a freak Zamboni accident. Rushin concludes his fast and funny read by mourning the fact there are no more “neighborhood bars, as they, like baseball, have lost their place of cultural primacy.” I beg to differ. 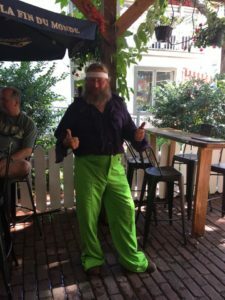 We have one right here, smack in the middle of downtown Fernandina Beach, overseen by eccentric Pajamadave Voorhees, who can give Sam Malone a run for his money, serving beer to beer nuts who watch baseball on his TV. As far as characters go, PJD’s Beer & Wine Garden at 12 South 2nd Street, boasts more than its fair share of ’em. I consider myself a regular and the folks I hang out with there don’t consider Starbucks or the Ritz Carlton a place to meet Mr. Right or Miss Right Now. And despite our wacky Mayor Moonbeam Miller’s desires there are no marijuana dispensaries here for locals to get a buzz on and hopefully never will be. This neighborhood bar, with its kooky cast of characters is alive and thriving but don’t expect to find a “mixologist” or an “artisanal cocktail.” However, there’s plenty of regular, Lite and craft beers, along with beer nuts perched on their regular stools. Will The "Looks-Like-An-Airplane" Terminal Top Atlanta's "Big Chicken" As An Attraction? Being a native of Jacksonville I grew up reading the local daily papers,the Journal and Times Union.There were really great writers both local and syndicated in both. Now it is only a shell of it’s former existence and what a shame,The north Florida area deserves a much better newspaper than this poor rag. Sadly,the one in Fernandina is actually worse leaving a large void in daily news reporting. Dave, you know I usually chomp at the bit to write a lefty rebuttal, but today, I am writing in agreement...on TWO things (imagine that?!). First, its absurd that the T-U has essentially priced themselves out of a readership base, and they will certainly feel the financial bite for this foolishness. They should give the paper for free to readers, well maybe not for free, but certainly not foe any more than they used to charge....because as an advertiser, I would want as many readers as possible- this price increase will not only run off subscribers, but likely advertisers. It doesn't make good business sense to me. And as far as David Yulee, you are right on about him. He was imprisoned for treason as a former U. S. Senator who chose to side with the Confederacy. Some people call the Civil War the "War of Northern Aggression", but others look at it as the War of Treasonous Rebellion...trying to destroy the Union and the fragile UNITED States in the process. I still can't understand why some people want glorify traitors to the United States, with statues and such, while calling the Confederate flag a heritage flag that simply stood for the splitting up of our beloved United States. I wish people would think about things, but that is sometimes too much to ask. Anyway, I am with you on both topics! Now just don't get used to me agreeing with you, haha! Pajama Dave's Beer Garden is hands down this beer nerd's favorite place on The Island. It is a hidden gem! Hi. 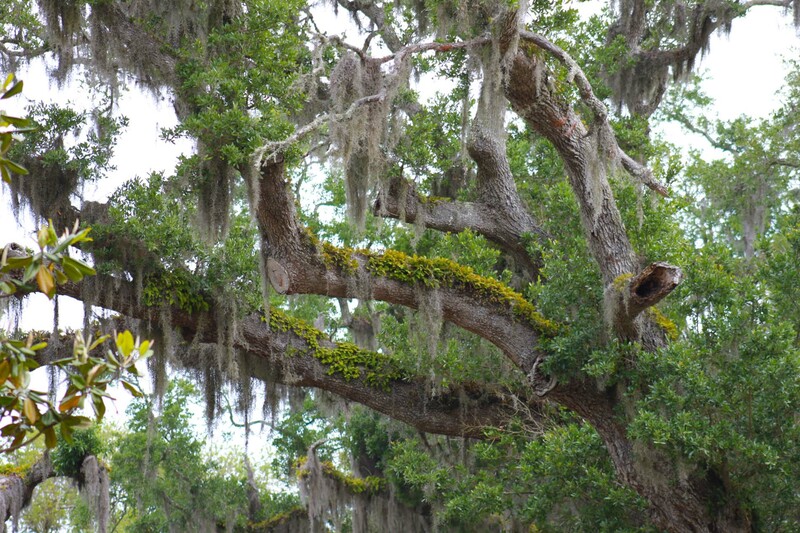 Enjoying reading your musings about FB and Amelia Island. Do you have thoughts about the recent legislation about beach access? Is beach access really limited to Peter's point? What's the story? Us snow birds want to know! The many beach access points on Amelia Island remain open to the public as do the "beach" areas seaward of the mean high water line (MHWL). Most private property ends at the MHWL. What's in contention is the "dry sand" areas of the beach which is the beach area landward of the MHWL. (Very loosely the land between the MHWL and the dunes.) The new law says that if local municipalities can prove that the dry sand beach has been in continuous, long-term use by the public (customary use) then the dry sand beach will remain "public". You can Google "new Florida beach law" for a more detailed explanation. 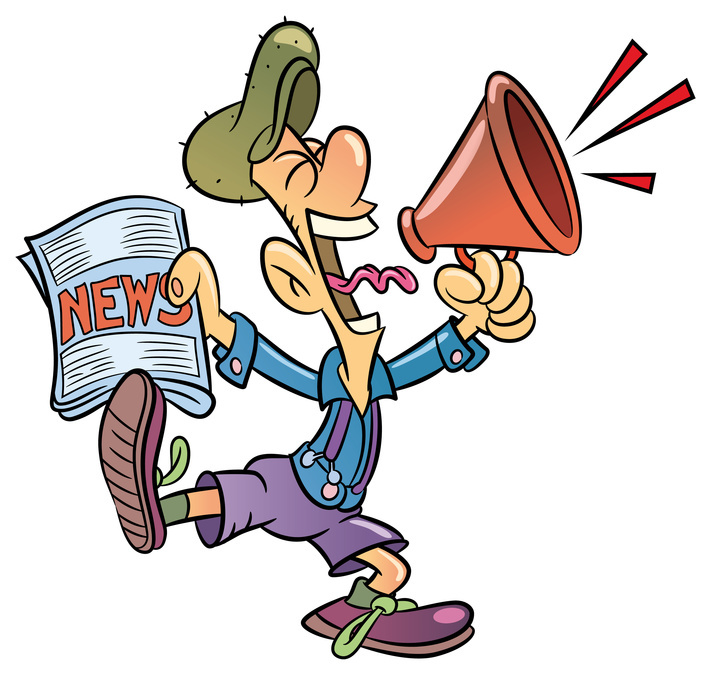 Also - I highly recommend the free online FernandinaObserver.com and the NCFLindependent.com for local news updates. Among other reasons I'm cancelling my subscription is the change in vacation stop credit. I travel several times a year. They screwed up my vacation stop in April by not stopping the delivery but, giving the credit. When I talked to them about it, I was informed they no longer give credit for the first 7 days of your stop. WHAT?!?!?!?!? That is robbery. That was the last straw! It will be cancelled after the "special" deal they gave me for a few months. I only read the obituaries anyway! I also got fed up with the content of The Week and dropped my subscription. Lo and behold they continue to send it to me so now I can do their crossword puzzle that I enjoy. Can't believe they will publish much longer. Not being a big sports fan, I cancelled my TU subscription nearly 15 years ago after realizing that (1) their national news was better covered by the local and national TV stations and (2) the "local" news pertained to Jacksonville and rarely to Nassau County. For more than a year after cancelling my subscription, I would receive "we miss you" notes in the mail with offers of a reduced subscription rate. Maybe they'll send you an offer you can't refuse. Dropped the Times/Union back in March and have an extra $50+ in my monthly budget. Do I miss it? Yes. You see Dave, now I don't have anything to put my throwaway coffee grounds in each morning. Dave , the cost increases of TU have consistently followed the decline in retail ads. Making the increases less tolerable is the rush to the left in their editorial content along with the "editorials" they interlace into "news" reporting. Today for instance there was a half page story of an illegal immigrant who was delivering pizzas onto Ft Hamilton in Brooklyn. Seems he was asked to show ID which was checked against a federal data base. Well, as luck would have it there was an immigration warrant for him, he was arrested, and is currently in detention. The story did not end there as it was not about the security of a military facility. No, we get a quarter page heart breaking picture of his young family being torn apart. The article commented about the legal support the city of NY and the State are bringing to his defense. ( Not in the article: he was granted voluntary departure status in March 2010, but failed to depart by July 2010 as ordered. He applied for residency in 2018 or EIGHT years after agreeing to leave). IMO, AP and TU omitted the info supporting his arrest as that would have reduced the impact of the sob story designed to malign our immigration laws . As the descendant of LEGAL immigrants myself, I feel moved over their plight. However, when one violates the law, twice, as in entering illegally and lying about voluntarily deporting and compounds that by waiting eight years to apply for residency, I fail to see how this situation is the fault of the our country or how it rises to the need for editorial propaganda. I enjoyed your blog, Dave. 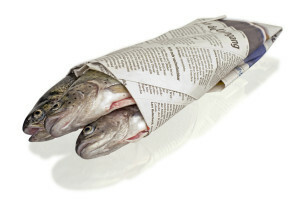 It seems to me that newspapers that are paper and one holds in their hand are losing way to reading the news on line. I personally would rather hold a paper book or newspaper in my hand. But then again I would rather have my change counted out by someone who can make change. I guess "the times they are a changing." As far as baseball goes I still love the game and play for Papa Murphy's in the over 65 softball league twice a week. And I love our local AAA team and stadium. Go Albuquerque Isotopes.